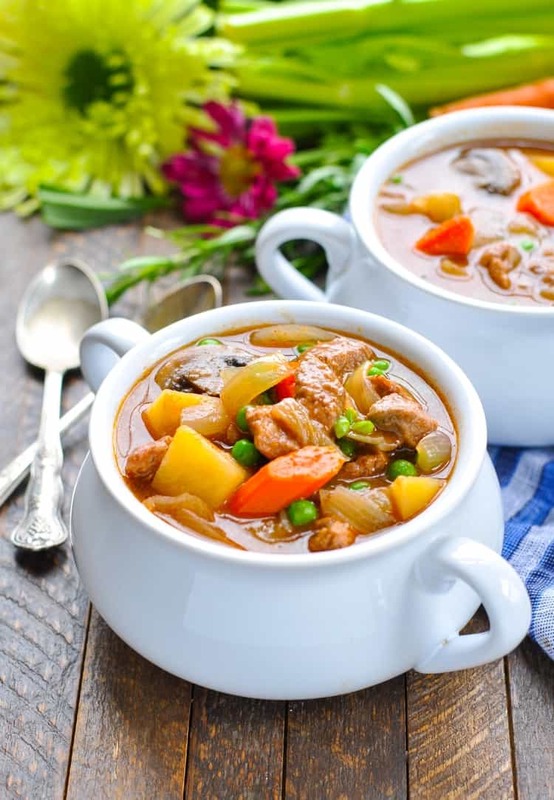 This classic slow cooker beef stew is so easy to prepare and simmers away while you get on with other things. It's so comforting and better yet it's made all in one pot! 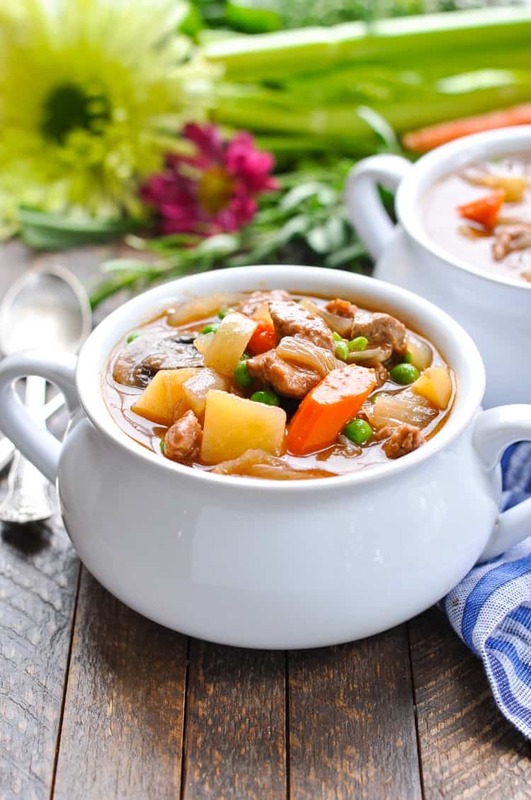 This classic Farmhouse Slow Cooker Beef Stew is an easy one pot meal that simmers on the counter all day while you go about your busy schedule. At the end of a chilly evening, it’s a nutritious and satisfying dinner that the entire family will love! 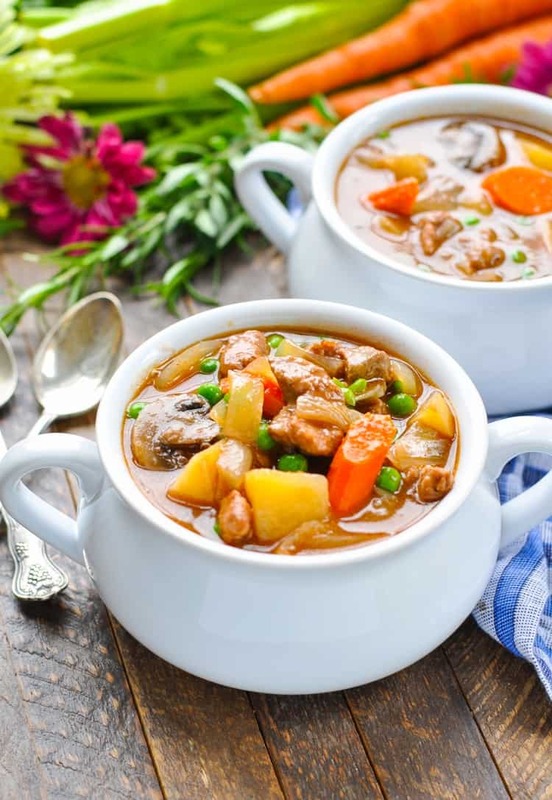 There are a handful of recipes that totally remind me of my childhood, and this Slow Cooker Beef Stew is definitely one of them. My mom is an amazing cook, and her Beef Stew is a signature dish. The smell of it cooking is enough to send me back to age 8! Naturally, I love sharing my favorites with my own family. When I moved into my own apartment after college, my mom put together a small recipe book of our favorite handwritten recipes. It includes my “comfort food” meals like her meatloaf, her spaghetti sauce, and her chicken and stuffing casserole. This little kitchen companion is now splattered with oil, dog-eared, and warped from water spills, but it remains one of my favorite “cookbooks” and is my greatest resource for making Mom’s meals in my own farmhouse. 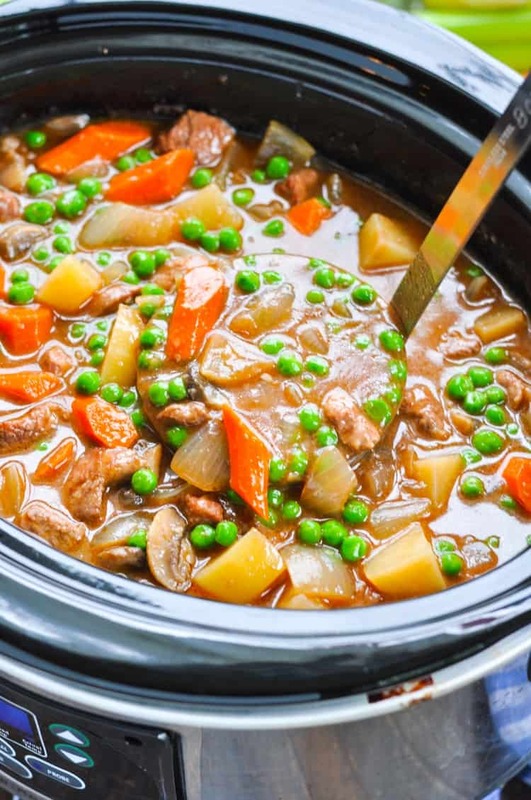 So when multiple readers requested a recipe for Slow Cooker Beef Stew over the past few months, I decided to pull out Mom’s handy little notebook and put a Crock Pot-spin on her classic dish. An Extra Tip For Big Flavor! I basically kept Mom’s recipe the same, with one exception. Mom doesn’t usually brown the beef before adding the rest of the ingredients to the pot. You can certainly skip that step in my recipe too, but I think that giving the meat a nice sear in the skillet first is an extra step that is well worth the time. It gives the beef a rich flavor and color that you wouldn’t otherwise get if you just tossed everything into the slow cooker at once. If you’re looking for an easy dinner that you can throw together in advance and then go about your busy day, this is the solution! 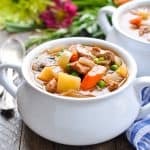 My Slow Cooker Beef Stew is loaded with vegetables, tender potatoes, and hearty meat for a flavorful, comfort food supper that will warm you from the inside out! Mom always freezes her leftover beef stew. It holds up very well in the freezer, but just be aware that the texture of the potatoes might change a little bit after they have been frozen. Place beef in a large Ziploc bag. Add flour, plus a dash of salt and pepper. Seal the bag and toss so that the beef chunks are coated in flour. Heat 2 tablespoons of oil in a large heavy skillet over medium-high heat. When the oil is hot (but not smoking), brown the beef on both sides until the chunks turn a rich color (about 8 minutes). You will probably need to do this in 2 or 3 batches so that the pan isn’t too crowded. Add more oil to the pan, as needed, with each batch. Place the beef and the remaining ingredients (EXCEPT for the peas) in the slow cooker. 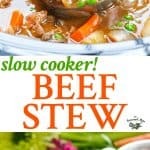 Cover the slow cooker and cook on LOW for 6-8 hours or on HIGH for 3-4 hours, until the beef and vegetables are tender. During the final 5 minutes, stir in the peas and continue cooking until heated through. This way the peas will stay green rather than turning mushy and brown. Remove the bay leaves, season with salt and pepper (to taste), and enjoy! 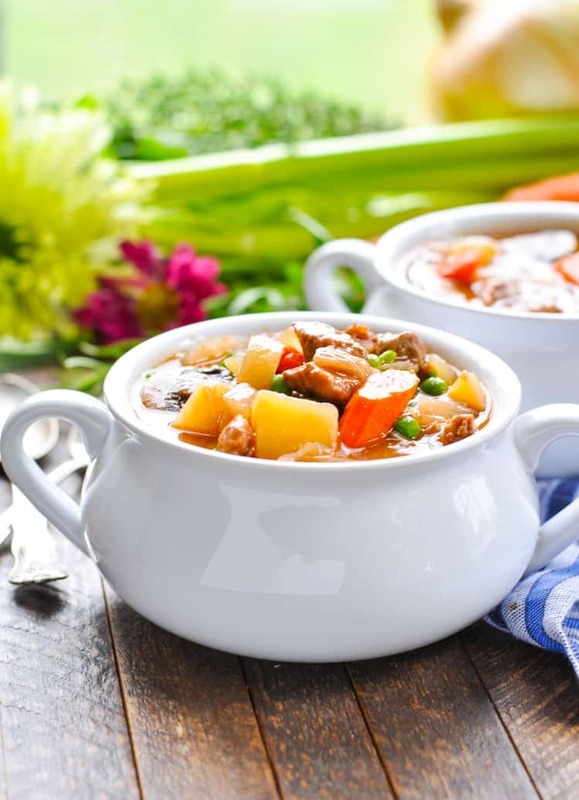 You can stir in additional water or beef broth as the stew cooks to reach your desired consistency. This reminds me of my childhood, too. One of my favorite comfort foods! Your version sounds delicious, Blair! I love that it’s made in the slow cooker and with hearty ingredients. I need to try this, and soon! Thank you, Gayle! I swear that comfort food from our childhood always tastes best! Oh wow, that looks absolutely fabulous, bursting with root veggies and fall comfort! This is one of the best beef stews I have ever tasted. It is so delicious, healthy and easy to prepare. I am making another batch on Sunday for some guests. Thank you for sharing this wonderful recipe. I love this time of year so I can eat stews like this, I like the trick of adding tomato soup that must add a lot of flavour. Can’t wait to try it! Thanks, Emily! I love soup and stew season, too!